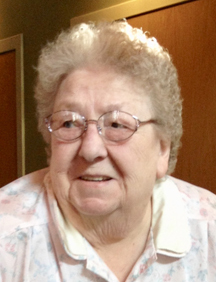 Mae Grace Pesola, age 83, passed away peacefully, with family at her side, on February 2, 2019 at Fair Oaks Lodge in Wadena, MN. Mae was born on January 31, 1936 in Ulen, MN to Grant and Alice (Christopherson) Olson; she was an only child. She attended vocational school to become a LPN which she worked as for many years at St. Mary’s Hospital in Detroit Lakes, MN and Dakota Hospital in Fargo, ND. Following retirement, she resided primarily in Staples, MN with her daughter, Debbie, and her grandsons Keifer and Christopher. Mae enjoyed the simple things in life including embroidery, casino trips, crossword puzzles, reading the newspaper, enjoying the company of her grand-dogs, watching crime shows, Game Show Network, and the Grand Ole Opry. She is survived by four biological children and 3 children whom she raised: Debbie Pesola of Staples, MN, Allen (Tamara) Pesola of Lakeville, MN, Steven (Darla) Pesola of Nashwauk, MN, Nancy (Ray Wilke) Jasch of Moorhead, MN, Kris (Bob) Kaiser of Dayton, MN, and Stephanie Wesala of Coral Springs, FL. She is also survived by 12 grandchildren, 12 great-grandchildren, 2 great-great grandchildren, and 3 grand dogs. She is preceded in death by her parents, Grant and Alice (Christopherson) Olsen, Mike Wesala, many other extended family members, and many pets. The family of Mae would like to offer special thanks to Dr. Bobbi D. Adams and the staff at Tri-County Health Care for many years of care, Fair Oaks Lodge and Knute Nelson Hospice for caring for her in her final days, and many friends at the Staples Hi-Rise that provided her with meals and socializing. Mae’s final resting place will be with her parents in Ulen, MN. Arrangements have been entrusted with Karvonen Funeral & Cremation Service of Wadena, MN. At the request of Mae, there will be no funeral services at this time. A celebration of life will be held at a later time with family and friends prior to internment.